A new day has dawned for the Knights, as the University of Central Florida today accepted a much-anticipated all-sports invitation to join the BIG EAST Conference. To watch a video of President Hitt discussing UCF’s future in the BIG EAST, click here. To watch a video of Thursday morning’s BIG EAST news conference featuring President Hitt, Interim Director of Athletics Al Harms and coaches George O’Leary, Donnie Jones and Joi Williams, click here. UCF will begin BIG EAST competition in 2013-14, taking on schools such as Notre Dame, Connecticut, Boise State, Georgetown, and Houston, while renewing a budding rivalry with the University of South Florida. UCF is home to more than 500 student-athletes competing in 16 intercollegiate sports. Since the BIG EAST’s establishment in 1979, conference members have won 31 national championships in six sports, and 133 student-athletes have won individual NCAA national titles. UCF’s athletics programs have grown in national prominence over the last several years. In 2010-11, its football, baseball and men’s basketball programs all enjoyed national rankings, while the men’s and women’s soccer teams both have competed in recent NCAA tournaments. Student-athletes have long been excelling in the classroom as well, with 219 student-athletes named to the 2010-11 Conference USA Commissioner’s Honor Roll. UCF has placed more student-athletes on the honor roll than any other public university in the conference for five straight years. UCF competes at the Division I level in football, baseball, men’s and women’s basketball, men’s and women’s golf, men’s and women’s soccer, men’s and women’s tennis, women’s rowing, softball, women’s indoor and outdoor track and field, women’s cross country and women’s volleyball. A member of Conference USA since 2005, UCF has won 15 conference titles across all sports. UCF teams also have played in 26 NCAA tournaments since then, and UCF student-athletes have won 33 Academic All-American awards. Football coach George O’Leary said the move is a major milestone for his football program and all of UCF Athletics. “This is a great opportunity for the UCF athletics program and the university to continue reaching their goals,” he said. The BIG EAST has a storied basketball history, and UCF’s basketball coaches look forward to competing against traditional powers such as Connecticut, Georgetown and St. John’s. The Connecticut men’s team won its third national championship last season, and two BIG EAST teams advanced to the women’s Final Four. In November, Coach Jones led the Knights to a thrilling comeback victory against defending national champion UConn. 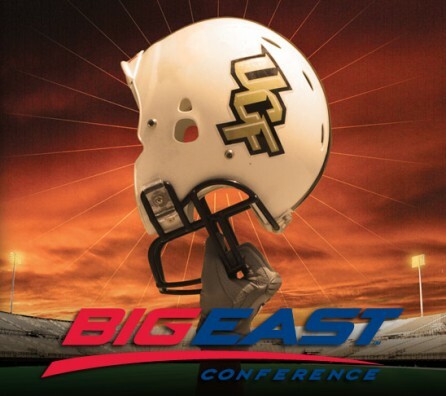 For comments from several other UCF coaches about the move to the BIG EAST, click here. Been waiting a long time for this. Congrats to UCF and her student athletes. This is a great day to be a Knight!